Welcome! Thanks for visiting my web site. I'm David J. Walker and I'm the author of twelve mystery/suspense novels. I'm a past president of the Midwest Chapter of Mystery Writers of America, and I live with my wife Ellen, just north of Chicago. I've been a parish priest, an investigator for the Chicago Police Department, and a lawyer. Now I mostly sit around and try to think positive thoughts about the future of the planet. Oh... and I write nearly every day. In the unlikely event that you'd like to know more about me, you might read an interview of me published a couple of years ago on the Sisters in Crime-Chicago web site. There is also an interview on author Jerry Peterson's blog. There is a section on this site called "My Word" and I use that space from time to time (perhaps not often enough) to share ideas which have been rattling around in my head and need to get out. My first book with a priest protagonist! Even a good man may feel driven to sign on with the devil. In Company Orders there's a life at stake and Father Paul Clark is losing hope. Suddenly a woman appears out of nowhere. She offers to help. For a price, of course. Not a big deal. And... oh... she's with the CIA. Or then again... maybe not. Soon a deal is struck, a deal which leads this good man into a struggle with death and deception at home, regime change in South America, and despair in his own heart. Paul Clark is about to learn how much easier it is to preach about love than to live it... Read an excerpt! 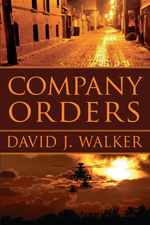 To see more reviews of Company Orders go to Goodreads, the world's premiere fiction readers' discussion and review website.